“Bring a tennis racket.” This was Smith’s sole request as I was packing for my fortnight in the Emerald City. I was thinking perhaps dancing shoes, an umbrella (not really…as a step child of Seattle I know never to use one), or a bikini for stand-up paddle boarding. But a racket? Egad I am not good at tennis. I can hit a baseball, set a spike in volleyball, and keep up the best of them on a sport-bike. But tennis? We arrived at Seattle Central’s dual courts, and to our chagrin, they were both taken. The sweet gent working alone on his power serves kindly asked if we wanted to join. I laughed and thanked his effort, but explained why that would not be such a good idea. Smith and I looked around at our options and noted the empty basketball court. No net, hmmm? Worse yet…no twelve foot fencing to keep us safely enclosed. We had only brought three balls and the construction workers working nearby didn’t look as though they would simply drop their sawzalls and retrieve wayward strays every five minutes. Glancing at the other tennis goers, we determined they were going nowhere fast. So, throwing caution to the wind, we set up on the basketball court. We looked each other up and down and had to chuckle at the dichotomy between the workout garb and the “evening wear” we had worn for our joint photoshoot the day before. Needless to say, I look ridiculous in running shoes and shorts. Next time I am wearing a short tennis skirt! And my entire outfit is going to be black! I had a running joke with a friend years back that we should take up tennis and only wear black. Black wristbands, black skirts, black shoes, black socks, black headbands, etc. We thought it would be hilarious. It is still funny in my own head at least, lol. We began. It did not go as bad as it could have, but we certainly got a fair workout by simply chasing down the balls. I certainly lobed a few onto the baseball diamond forty feet away and Smith knocked a couple into the neighboring courts. The others were generous in returning our property but I can totally picture that they threw the balls back and turned to their partner and rolled their eyes. Given how bad we were, I would have rolled my eyes as well, lol. After a good thirty minutes we gave up and threw around the half flat basketball someone had left on the court. That did not go much better. I played only one year of basketball in high school for a reason. No bueno! I was pleased to see that Smith knew how to dribble and shoot like an old timer. I will need to take notes next time. After Smith’s interest waned in my serious lack of coordination, he showered and headed off to school and work. I meandered home after purchasing a smoothie and prepared for my afternoon rendezvous with one of my favorite Seattle gentlemen, Elm. He had recently had a birthday, and as he is one of the best gift givers on this glorious planet Earth and I adore him, I walked to Seattle Caviar Co. and grabbed a bottle of his favorite champagne. And of course a jar of perfect minuscule grayish black pearls! Elm and I celebrated his birthday in style via a glorious afternoon. He left with a smile on his face and as I gingerly closed the door after our departing kiss, I also with a smile, melted happily into the red velvet chaise lounge with a book (Diane Preston’s The Boxer Rebellion). Roughly around 7:00pm, Smith and I decided to finally try the new speakeasy bar on Capitol Hill, The Knee High Stocking Co. Oh…My…Goodness! I was instantly in love. One of Smith and my favorite bartenders in all of Seattle recently took up residence behind the intimate wooden and well stocked bar. After hugging hello our ringleader for the evening, we jumped into sampling the food wares and libations. The cauliflower with anchovy butter is oh so tasty and the rarebit and pretzel is a must. I don’t even like pretzels, lol. For drinks, I tried a cup of one of their house punches. Peach mint julep. I could have downed that entire bowl! Also, as the vibe of the place calls for it, I partook in a glass of absinthe. There is nothing quite like the ritual of an absinthe fountain languorously dripping water onto the sugar cube nestled above the verdant tonic. I slowly savored each sip and felt instantly thrust back into the 1920’s. 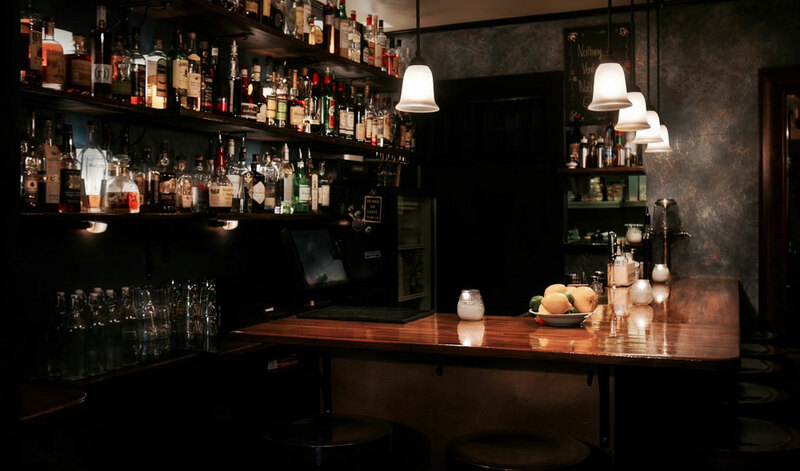 Knee High’s dark blue walls, dark wood, chandeliers, and moody jazz all come together and scream speakeasy. All that is missing of course is a light haze of cigarette smoke. Smith and I must have stayed at Knee High for four hours. We laughed away the evening with some friends that stopped by, the owner, and of course the jubilant bartender. A couple of us may have even tried some new dance moves as one of us in a hip hop class and the other is in a salsa class. That of course brought more laughter. I decided I should probably head home around 11:00pm as I had an early morning appointment. As much as I would have adored staying at Knee High, I really enjoy my morning time with gentlemen and I am quite sure they appreciate me looking refreshed after a good seven hours sleep, lol. I bid farewell to my old and new friends at my new favorite bar and gave Smith a huge hug and kiss. We went our separate ways for the evening as he had a lady friend that desired his company for a night cap. I walked home, brushed my teeth, and smiled into the mirror before jumping under the covers. Oh how I love summery days and nights in Seattle…tennis rackets and all.